Food- whether you are cooking it or eating it- is elevated when it’s fueled by inspiration. When a chef expresses their history and experience through food, it shows up on the plate. 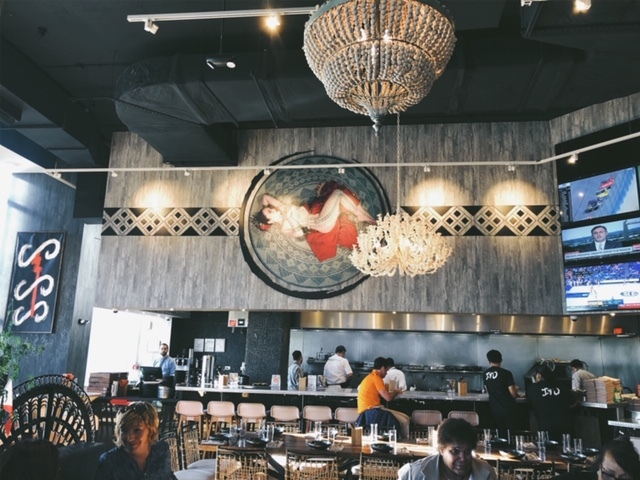 When a diner translates that effort to ignite their own memories or to explore a culture or cuisine, it makes for an engaging dining adventure. Kaliwa, the Southeast Asian restaurant from Irish-born Chef Cathal Armstrong, doesn’t seem like the direction you would expect for his newest restaurant on The Wharf. This is the chef who brought us the excellent (but now-closed) Restaurant Eve and Eamonn’s in Alexandria, among others. So why a menu divided neatly into three buckets- Filipino, Korean, and Thai? Each country is represented by eight dishes, some intended as starters, others more suited as mains. If you’re familiar with the most popular dishes from this trio of countries, you’ll connect to what’s on the menu. And if you’re not, you’ll enjoy the journey. First up to capture my attention is Sisig, a popular dish in the Philippines, which is gaining traction in the U.S. It’s an addictive combination of crisped bits of pig, rice, calamansi lime, and chili, topped off with a fried egg. In the Philippines Sisig is commonly considered bar or street food and is primarily a vehicle for all the leftover parts of a pig. 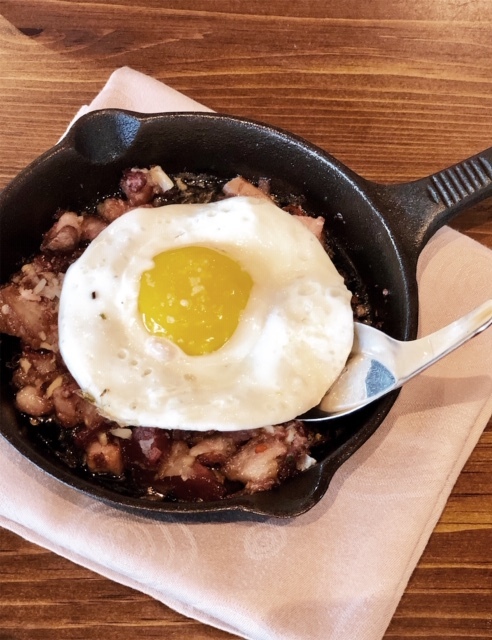 It’s typically served in a cast-iron skillet, sizzling and tantalizing with its shiny components. It sets the tone for the rest of the meal at Kaliwa, as it begs to be enjoyed communally and is bursting with flavor. Every cuisine imaginable seems to have a signature dish featuring some kind of dough and a meat or vegetable filling. The Philippines has Lumpiang Shanghai. 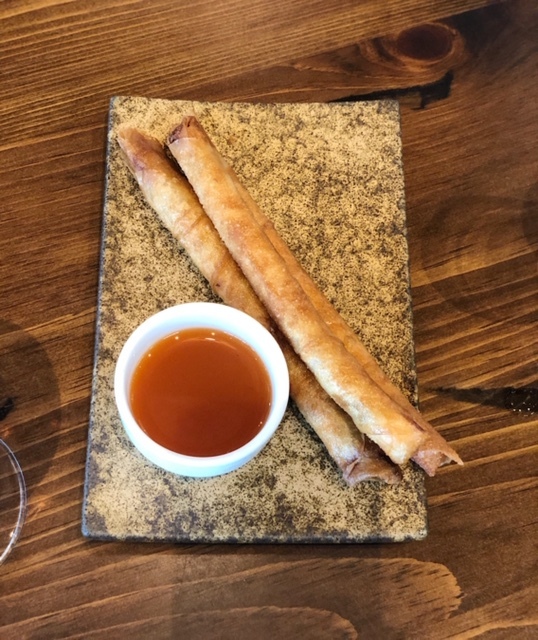 At Kaliwa the long, thin, crispy spring rolls are filled with a combination of minced shrimp and pork and presented with a tangy sauce that adds interest- and a welcome kick. 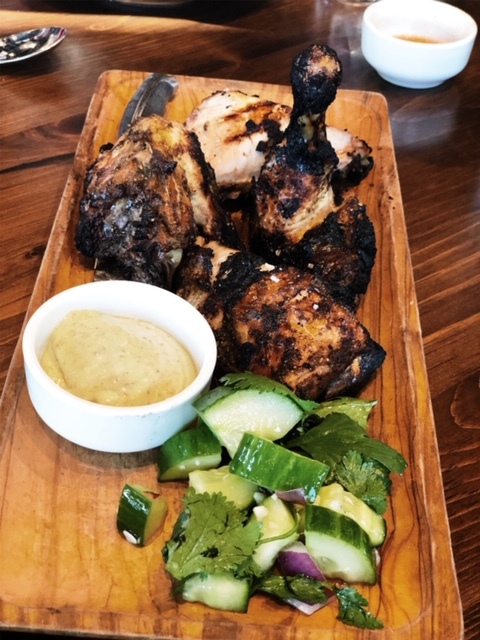 The Thai side of the menu includes wood-grilled half chicken with Naam Jim (sweet Thai chili sauce) Mayonnaise. Give me a well-executed grilled chicken and I’m a satisfied diner. It’s not as easy as it sounds. My benchmarks are deeply charred skin, moist meat, and a hot and sassy sauce. Kaliwa hits the mark on all three. 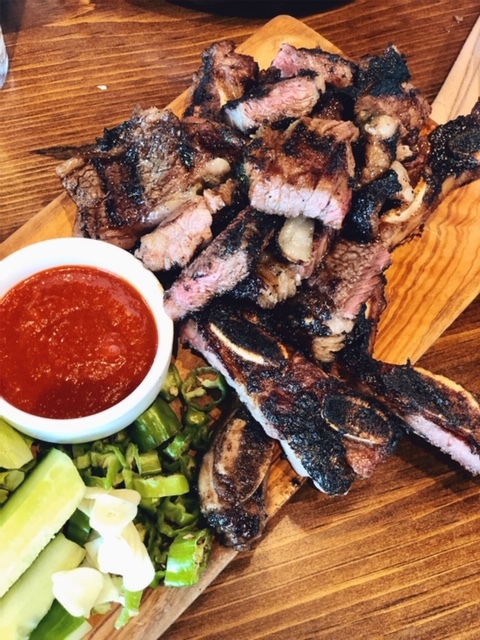 Also benefitting from a turn on the grill is Korean galbi, better known as marinated beef short ribs. This cut of meat tends to be fatty and finding the meat on the bone can be a scavenger hunt. But the marinated meat is tender and worth the effort. Accompanying chili sauce adds just the right amount of sweet and heat. Kaliwa’s options for vegetarians are limited. Thailand provides the inspiration for two vegetable sides. There are stir fried green beans with chili, which should not be confused with stir fried greens with chili, garlic, and ginger. I find myself reading the descriptions more than once before I can process the fact that one dish features green beans and one is composed of greens. I’ll blame wine on my dysfunction. We go for the greens, glossy and spicy, and beckoning me back for more. Vegetarians seeking a more substantial dish are faced with limitations. 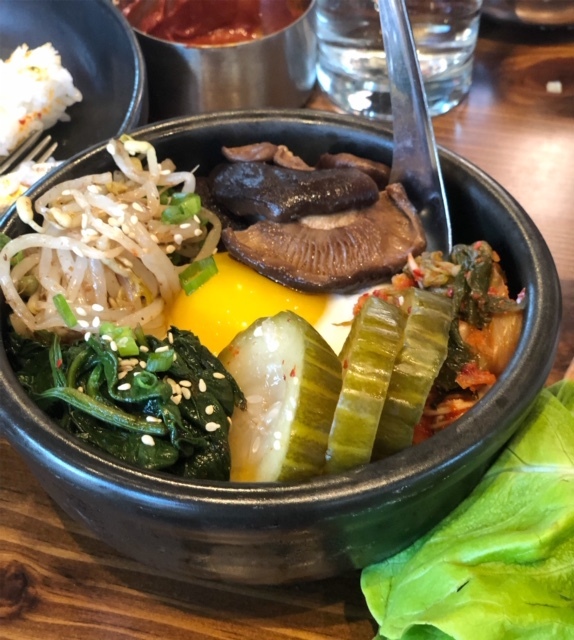 The popular Korean specialty bibimbap is a bowl of rice topped with pickled vegetables, gochujang (red chili paste) and egg. It’s not a mind-blowing option but it’s warm and comforting. On the Thai side is Green Curry, with vegetables, coconut milk and an option to add tofu, which is likely a more flavor forward choice. There’s one vegetarian dish that leaves us cold. Chilled noodle salad or Jolmyeon, which is a chewy Korean noodle. There’s not much to the dish besides noodles, carrots, cucumbers, and gochujang. We order the large portion for $20. This has me shaking my head and heading back to the Philippines and the sisig for sustenance. The décor at this Wharf restaurant makes a splash. There is wicker and wood and cozy red banquettes. You must look up to take in the full effect of basket lamps intertwined with imported chandeliers. There is a commonality that threads its way through the food at Kaliwa. It’s most pronounced in the various sauces that make their way onto the table as the meal progresses. There is a mingling of sweet, sour, salty, spicy, and bitter, typical in Southeast Asian cuisine, and well-executed here. I like Kaliwa with its jumble of Southeast Asian dishes. 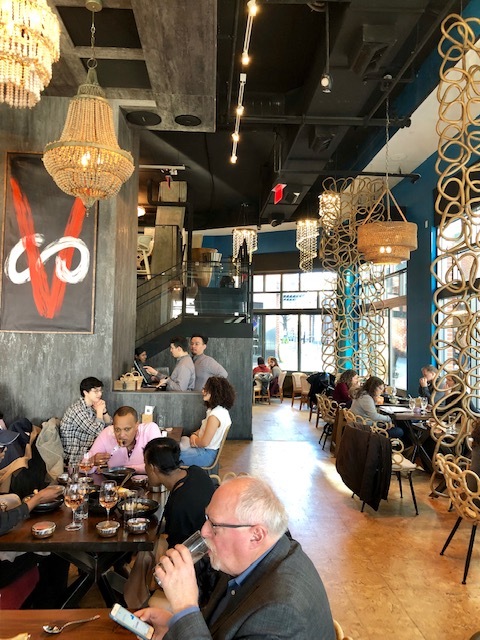 It’s a restaurant rooted in tradition and the spirit of sharing, and the potential to create bonds between cuisines and its diners.